6/25/2007Share this story on Facebook! Ithaca College psychology professor Nancy Rader spent the past few months studying Australian diver Lloyd Godson, who won Australian Geographic’s “Live Your Dream” Wildest Adventure Competition. Godson’s winning proposal was a sustainability demonstration that involved being submerged in a pond in Albury, Australia, in a life-supporting chamber. 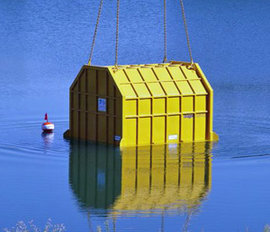 Called the BioSUB, the apparatus was submerged for almost two weeks. Once underwater, Godson had to grow his own food, generate his own oxygen, obtain his own fresh water, and dispose of his own waste. Using specialized software, Rader monitored Godson’s psychological well-being while underwater. She was accompanied by psychology major and research assistant Livanna Homstead ’07.